We analyse current practises used in your organization, evalute them on effectiveness and if neccesary provide best practice tools and benchmarking systems from around the world. Innesskirk consultants are accredited in world leading HR consultancy products like the tools from Human Synergistics and the American Management Association as well as other management diagnostic and behavioral assessment tools. These tools provide an integrated HR diagnostic system, measuring effectiveness for individual employees, managers, executives, teams, departments and overall organizational culture. People are the heart of any organization. So how do you get people to work towards a better organization? How do you get everybody on the same page, at the same time, moving in the right direction? It requires careful planning and a simple and unified language to discuss ideal and current operating organizational culture. 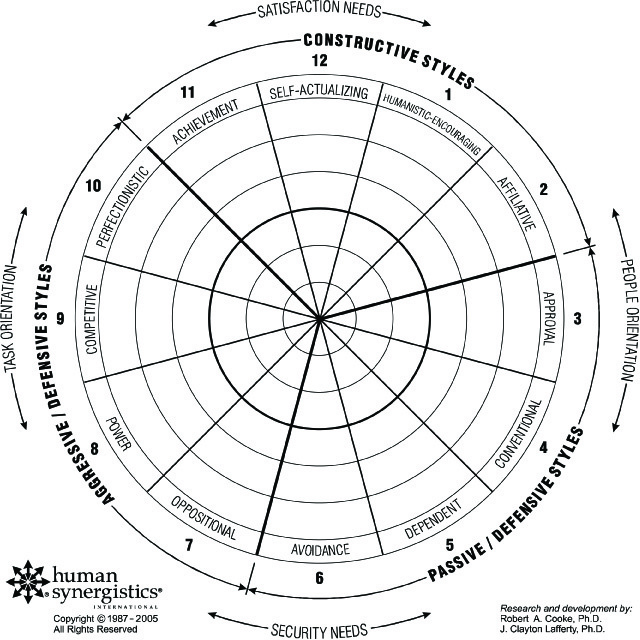 Whether you are measuring individual, team or organizational effectiveness, the picture below, the circumplex is used in all the instruments provides this common and consistent language for feedback, analysis, and change initiation. Organizations provide their own data and decide on their ''ideal business culture" in most cases this is a clear constructive, positive achievement focused business culture. "current operating business culture" are established, which are often passive and aggresive defensive in nature, - gaps between current and ideal become clearly visible. This method is independent of world culture - east and west, since the organization leaders set the ideal culture profile. Benchmarks set can be used to gauge improvement at regular intervals. Internationally research proves that constructive cultures are better performing and yield better long term financial results. If you want to know more, please download the Innesskirk company profile. To find out more about our range of workshops download the Innesskirk workshop catalog. or look at the A-Z Course library, to book a course or to discuss your training needs further contact one of our offices or send us an email.